McGraw-Hill has proudly partnered with Align, Assess, Achieve LLC to distribute The Common Core: Clarifying Expectations for Teachers and Students. These easy-to-read flipbooks are an indispensable resource for educators seeking to isolate and understand the grade level expectations of the standards. 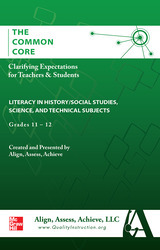 Because each guide's focus is on a single grade (or select range of grades), the roles of classroom teachers are clearly defined, ensuring a more seamless transition to the Common Core.Three flipbooks unpack the standards for Literacy in History/Social Studies, Science & Technical Subjects, and Writing for each grades 6-8, 9&10, and 11&12. Each page unpacks standards in the same manner at the English Language Arts Books with the College and Career readiness anchor standards and grade level specific standards translated into clear teacher-friendly text.